The companies, the second- and third-largest oil-service firms, announced in a statement May 1 that the combination had been terminated. The companies had set a deadline for the end of April to complete the deal or walk away. Halliburton will pay Baker Hughes a $3.5 billion termination fee by May 4. “While both companies expected the proposed merger to result in compelling benefits to shareholders, customers and other stakeholders, Challenges in obtaining remaining regulatory approvals and general industry conditions that severely damaged deal economics led to the conclusion that termination is the best course of action,” Halliburton Chairman Dave Lesar said in the statement. Halliburton announced the Baker Hughes takeover in November 2014 in a bid to better compete against industry leader Schlumberger Ltd. The U.S. Justice Department filed a lawsuit in early April to stop the merger, saying it threatened to eliminate head-to-head competition in 23 products and services used in oil exploration. 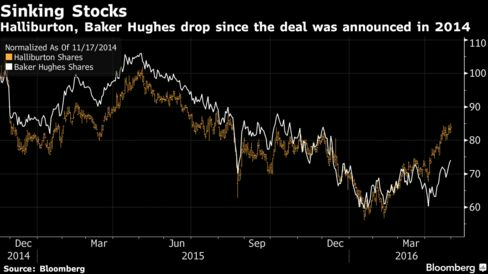 Shares of Halliburton and Baker Hughes have declined amid the worst oil slump in a generation, reducing the deal’s value from $34.6 billion when it was announced. “The companies’ decision to abandon this transaction -- which would have left many oilfield service markets in the hands of a duopoly -- is a victory for the U.S. economy and for all Americans,” U.S. Attorney General Loretta E. Lynch said in a statement. Analysts voiced further doubts on the deal getting done after Halliburton announced April 22 a delay in its first-quarter earnings release to May 3 from April 25. Halliburton sold $7.5 billion in notes in November, which built up its cash reserve to a record of more than $10 billion -- a stockpile that will help cover the $3.5 billion fee. It offered to sell additional assets in February in an effort to appease the antitrust concerns. The price of West Texas Intermediate, the U.S. benchmark crude, has fallen by more than half since the middle of 2014 to just above $45 a barrel. The industry has responded by slashing more than $100 billion in spending and eliminating more than 250,000 jobs in what Schlumberger has called the worst financial crisis in the industry’s history. "We don’t buy the narrative that BHI will be a disaster if the merger with HAL doesn’t consummate," J. David Anderson, an analyst at Barclays Plc, wrote April 28 in a note to investors. Rather, a stand-alone Baker Hughes with $3.5 billion in cash from the breakup fee can help rebuild its BJ Services business, cut considerable costs and boast a strong technology portfolio that could draw new suitors, he wrote.